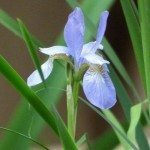 What kind of soil do I use when re-potting Water Iris? Can I buy the soil at The Home Depot or Lowes Garden department? I re-potted Iris last year using "Potting Soil" but every one of them died. I also put Iris clumps that I divided tucked around some boulders and rocks around the pond and they all lived.